At the end of September, I finally signed up for my first personal Community Shared Agriculture program. I had considered joining a CSA in years past as it seemed like an ideal way to source food from local farmers, but the large upfront cost and time commitment required by many programs scared me off. I also worried that there would be too much produce for a single person to get through before the food started to turn bad. It was in regards to these concerns that Fresh City Farms offered an alternative, convincing me to give CSAs a try. My account is charged per delivery, which I can cancel at any time, and I can customize the size and frequency of my deliveries within very reasonable terms. So now I am three deliveries in and I can confidently say that this investment has been one of my wisest purchases this year. Community Shared Agriculture programs support farmers and food processors by generating revenue from customers upfront, often before the growing season. Consider it as a micro-loan of sorts, with shares paid back as bundles of produce! There is a lot of power in this type of program as it creates a more stable financing structure for food producers. With increased financial security, producers can also make more steady improvements on their capital. In many ways, it reflects more value of the hard work farmers commit day in and day out and removes some risk posed by factors out of their control. 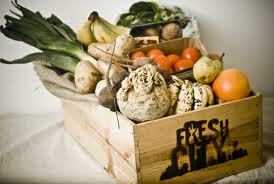 Read more about CSAs at the Ontario CSA Farm Directory website. The neat thing about CSAs for the consumer is that you are receiving food that often meets a certain criteria that you may not have the time to always conveniently source later on when you’re hungry and at the grocery store. When selecting a CSA, you have the opportunity to research the farms you’ll be receiving food from, forging a social link that’s become obscured in modern urban societies. As well, I’ve found that with my CSA arrangement, I’ve become more in touch with the availability of produce season to season, as well as using a greater variety of vegetables and fruits than I would otherwise likely purchase. For example, as many of my friends heard, I was dumbstruck by the gigantic hearty romaine leaves in my first delivery – they were the size of place mats! I ended up sauteing the stemmed-and-chopped leaves with garlic and EVOO as I might with spinach and it was delicious if still a bit rough. All in all, it serves as a learning experience in sustainable agriculture. I feel like I’m collaborating with the very land – “So you’re healthier soil when you grow this kind of stuff? Okay, I’ll learn how to cook it.” As well, it engages with a social aspect of food preparation as each delivery comes with a newsletter with community-contributed recipes, backgrounders on particular farmers or items, and weekly event listings. I still go to the shop to buy a few supplement items, but overall, this large biweekly haul saves me a lot of time and planning. The coolest thing about Fresh City is its proximity of to the urban core. Their main space is a 1 acre farm at Downsview Park (they’re on the subway line, people! ), and its farmers are combating sprawl by adapting green spaces and backyards throughout the city and making them into active food-producing plots. Fresh City also runs workshops on topics such as indoor herb growing, providing another social venue for people to learn about agriculture in small spaces. What’s not to love? Projects like Fresh City and other CSAs help to increase the social presence of agriculture in urban environments by connecting consumers directly with producers, rebuilding channels for dialogue and collaboration. That seems like a step in the right direction to me. Fresh City Farms is hiring farmers and interns! Info sessions are held on Tuesday evenings at the Downsview location. See links for more details. You’ve really inspired me to check out this CSA. It seems really flexible, and a great way to support farmers. Thanks! Hi Beth! Thanks for commenting. I think that this kind of flexibility is what will make CSAs more popular, and hopefully just as effective in terms of supporting farmers. I’m so glad to hear that you’ll look into Fresh City Farms. I’m getting another delivery this week and they just sent out the ‘Expected Contents’ email the other day so I’m already piecing together some recipe ideas.